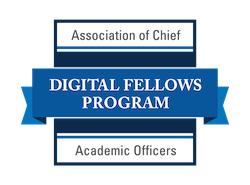 In January 2017, the Association of Chief Academic Officers (ACAO) launched the 18 month ACAO Digital Fellows Project. This fellowship program, supported by the Bill & Melinda Gates Foundation, is designed to provide senior campus leaders (i.e., Chief Academic Officers or CAOs) the critical information, resources, and support they require to help their faculty understand and adopt high quality digital courseware that personalizes learning and leads to significant gains in undergraduate engagement, retention, and graduation. Specifically, the project will provide a unique professional opportunity for 30 provosts/CAOs (“ACAO Digital Fellows”) that focuses on the adoption and deployment of courseware and digital learning resources intended to enhance student learning, increase retention and degree completion, and improve institutional outcomes. Dissemination activities (including reports, conference presentations, campus case studies, webinars, and web resources), which will extend the reach and impact of the ACAO Digital Fellows Program. Join Our Discussion Forum Today!